Home sellers are in a race to beat the wave of foreclosed homes and distressed properties that are moving into an already abundant real estate market in Tallahassee. No matter the zip code in Tallahassee, there are far too many foreclosed homes entering the mix. The real estate graph above shows that the 32312 zip code is the strongest, with 20% of all sales coming from foreclosed homes and distressed property sales, while the 32305 and 32310 zip code have surpassed the 50% mark. Think about it. Two zip codes already are seeing more foreclosed homes and distressed property sales than arms length sales. Will this trend be coming to a neighborhood near you too? Home values are dropping and more foreclosed homes are entering the market, meaning pricing pressures are going to continue. People who need to sell a home but wait two years will have to sell their homes for less money and get less favorable terms from the banks. If you know you're going to have to sell in the next few years, do yourself a big favor and contact me today! The number of foreclosed homes and distressed property sales are on the rise, and the toughest part of this for home sellers is that properties in newer conditions are the ones most often going into foreclosure, and that means properties with modern amenities are selling at lower prices everyday. 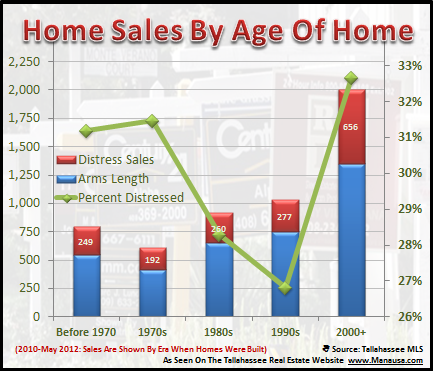 When we look at home sales in Tallahassee, sorted by the age of the homes that were sold, we can see that the newer ones are becoming foreclosed homes at a faster rate than are the older ones. Think about how a surge of these new homes hitting the market will affect your ability to sell a home. You will be trying to get a fair price for your home, but then a newer home with a newer roof, a newer heating and cooling system, and more modern amenities hits the market at a lower price. Which home do you think will be the next to sell? I have been saying this for more than five years, plan to hold your home for many more years, or sell it right away. Those that try to wait-out the market for another year or two will end up selling a home for less. Remember, recent foreclosure and lis pendens reports show that new foreclosed homes are on the rise. This is not a declining trend! If you are not certain about what to do, take some time to explore all of your real options. 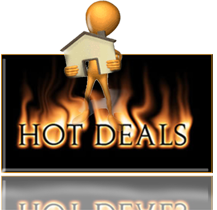 There are actually some great tactical opportunities available today for homeowners who still have good credit. If you want to know more about these opportunities, just drop me a note and we can schedule a time to figure out your best plan for housing, knowing a wave of foreclosed homes is right around the corner.